Tamil Tiger rebels have warned the winner of Sri Lanka's presidential election, Mahinda Rajapakse, of the dangers of any move to break the country's three-year-old ceasefire. "If they try to use military means to occupy our land or wage a conflict it will have negative implications for the other side," the leader of the rebels' political wing, SP Thamilselvan, told the BBC. "We hope that they will understand the reality." In his victory speech in Colombo, Mr Rajapakse promised to bring "an honourable peace to the country". How he aims to do that is not clear. In his campaign he criticised his main rival for making too many concessions to the Tamil Tigers. Mr Thamilselvan said that Mr Rajapakse was adopting the wrong strategy in promising to take a hard line with the Tigers. The Sinhala leadership, he said, should try to understand and address the political aspirations of the Tamil people. For his election campaign, Mr Rajapakse secured the support of the hardline Sinhala nationalist JVP and the Buddhist-clergy led JHU party. Both these parties have been urging the government and the public to take a tougher stance against the Tigers. Mr Thamilselvan said he understood the promises made by the Sinhala politicians during the elections but now they should try to understand the ground situation. "Whoever comes to power they should try to address the political aspirations of the Tamils." Sri Lanka's civil war has left some 64,000 people dead and a million displaced. The Tigers instigated a ceasefire in 2002 but pulled out of peace talks the following year. The sticking point has been the issue of interim autonomy for the Tamils while a final peace agreement is reached. 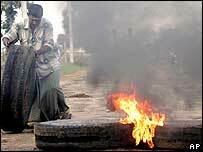 The 2002 ceasefire came while the defeated presidential candidate, Ranil Wickramasinghe, was prime minister. There was widespread apathy among Tamils in the north and east of the island ahead of the poll. On the day, very few voted. Those within Tamil Tiger-controlled territory had to travel to the borders of those areas where the polling booths were set up. Those that did want to vote faced roadblocks in some places and there were reports of intimidation. The Tigers said they were not interested in who would win the presidential race, saying that both the main presidential candidates had used the peace issue to win votes. In the northern town of Jaffna, turnout was put at only 0.014% of more than 700,000 registered voters - the lowest ever anywhere in the country. On polling day Jaffna was like a ghost town, with shops shut and almost no traffic on the road. On Friday supporters of Mr Rajapakse stayed indoors, despite his victory. While Jaffna residents heave a sigh of relief as there was no major election related violence the new political reality is also slowly sinking in. "We are not happy that Mahinda Rajapakse has won the elections. If the Tamils here had voted then Ranil Wickramasinghe could have won," said one resident who did not want to be identified. While many here feel that they had to stay away from the polls because of the Tamil Tigers, they feel sorry for Mr Wickramasinghe, who was instrumental in signing the ceasefire agreement with the Tamil rebels in February 2002. According to one Jaffna University student, following the 2002 ceasefire agreement, security measures were relaxed greatly, benefiting civilians. "Now with hardline parties behind the president we are not sure what will happen to us once again," he said.